Soap bubbles float on a cushion of carbon dioxide gas. This beautiful investigation illustrates the principles of buoyancy and semipermeability. 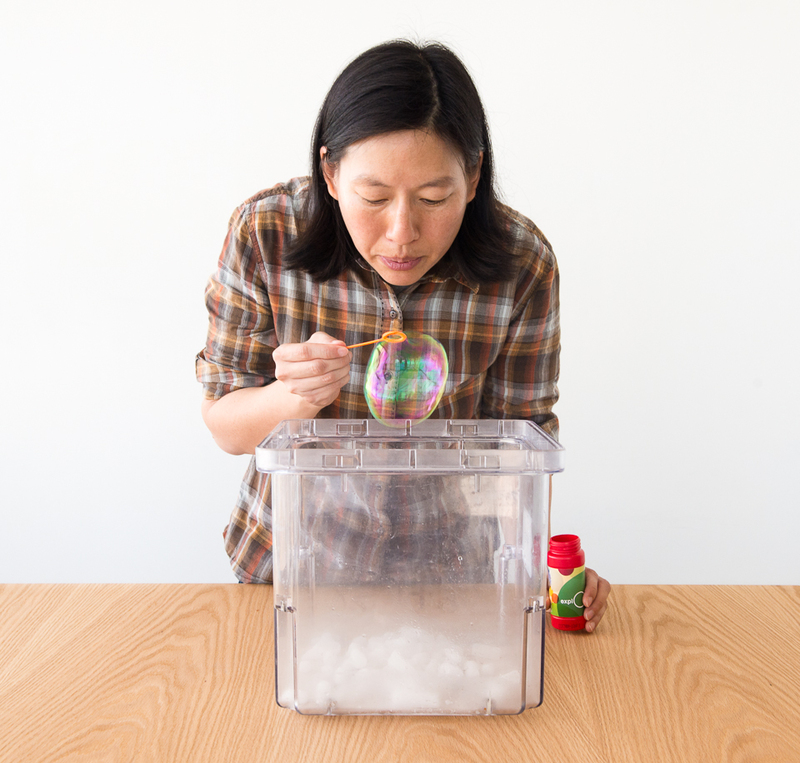 Bubble solution note: If you have trouble making good bubbles, try using distilled water instead of tap water. Aging the solution for at least a day before use significantly increases the lifetime of the bubbles. Safety note: Never let dry ice touch your bare skin! Always handle dry ice while wearing thick protective gloves. Put on protective gloves, and then place a slab of dry ice flat in the bottom of the clear container. Allow a few minutes for a layer of carbon dioxide gas to accumulate. Note: See our tip about bubble solution in the Tools and Materials section above. Blow bubbles so they float down into the clear container. The bubbles will descend and then hover on the denser layer of carbon dioxide gas accumulating above the dry ice. After a few minutes, notice that the bubbles begin to expand and sink. Notice how some of the bubbles freeze on the dry ice. As dry ice turns from a solid to a vapor, or sublimes, it produces carbon dioxide gas. Carbon dioxide is denser than air. (Carbon dioxide molecules have an atomic mass of 44 amu [atomic mass units]. Air is made up mostly of nitrogen, 28 amu, and oxygen, 32 amu.) The denser carbon dioxide gas forms a layer on the bottom of the container. A bubble is full of air. It floats on the carbon dioxide layer, just like a helium balloon floating in the air. You might expect that the air in the bubble would cool and contract near the dry ice, but the bubble actually expands slightly. The soapy wall of the bubble allows carbon dioxide to pass through but keeps air molecules inside. Initially, the concentration of carbon dioxide gas is low inside the bubble and high outside the bubble. The gas gradually diffuses into the bubble, a process called osmosis. The bubble film is a semipermeable membrane—a surface that allows some substances to pass through while preventing others from doing so. The cells in your body have the same property. Water, oxygen, and carbon dioxide easily enter some cells, whereas other molecules do not. The added carbon dioxide makes the bubble denser, causing it to gradually sink. The carbon dioxide at the bottom of the tank is cold enough to freeze the bubble. What happens when bubbles of different sizes collide? Sometimes they make a single larger bubble; other times, they join as two bubbles with a flat or bulging wall between them. If the two bubbles are the same size, the wall is flat between them, because the pressure is equal on both sides. If the two bubbles are of different sizes, the wall will bulge away from the smaller of the two bubbles because the smaller bubble will have a higher pressure inside. How does a bubble respond to a comb that has been charged by rubbing it with a wool cloth? The near side of the bubble is given an opposite charge by the comb, as ions in the bubble with the same charge as the comb are driven to the far side. The bubble is then said to be electrically polarized. The electrically polarized bubble is then attracted to the comb.